CARBONDALE, Ill. — Looking for a fun way to expand your child’s horizons and get them involved in art? The Saturday Young Artist Workshop is gearing up for the 20th year, featuring an exciting study of food as art. 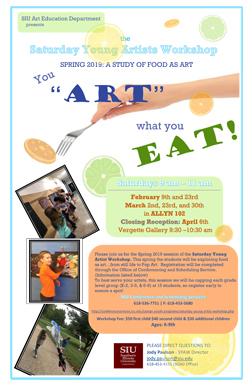 The 2019 spring series, “You ‘Art’ what you Eat!” is open for children K-9, with three different class levels specifically designed to meet each student’s needs. Participants will explore food as art in a variety of fun ways, from still life to Pop Art. While focused on a central theme, students each get to work on a project under the guidance of a teacher. Some students might tackle one bigger project, while others experiment with several ideas. 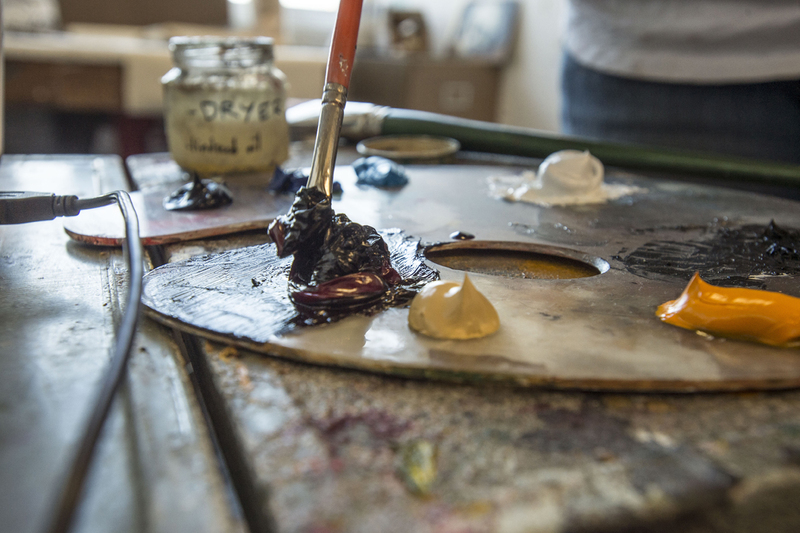 Possible art forms include work with ceramics, printmaking, painting, drawing, collages, paper machete and more. For Jody Paulson, SYAW director, the program is an excellent way for young students to try new things and build their personal art skills. "When a student leaves our workshop we hope that he or she will know a little more about art history, art techniques, and art making and that they will have found confidence in their creativity," Paulson said. The program starts Feb. 9 and concludes with a closing reception on Apr. 6. All classes will be held on the Southern Illinois University campus in the Allyn building room 102. The workshop fee is $50 for the first child, $40 for the second child and $30 for additional children. All programs are fully inclusive for students experiencing disabilities. 9-11 a.m. on Feb. 9 and 23. 9-11 a.m. on Mar. 2, 23 and 30. 9:30-10:30 a.m. on Apr. 6 (closing reception). The closing reception will give students the chance to display their work in the Vergette Gallery and will include light refreshments. Call 618/536-7751 to register over the phone with VISA, Mastercard or Discover. For registration questions contact Jackie Welch at 618/536-7751 or email jackiew@siu.edu. Scholarships for a 50 percent reduction are available with a phone call or email from an art teacher to Jody Paulson at 618/453-7765 or jody.paulson@siu.edu. Sponsored by the SIU Art Education Department, this long-standing program serves two key purposes. First, it provides local children the opportunity to gain personalized art instruction in a format that encourages individual expression. Additionally, the program allows pre-service art teachers to gain experience as they teach art in a structured environment. The student teachers prepare and teach the art lessons, working under faculty supervision in a lab-like setting. For more information, contact Jody Paulson, SYAW director, 618/453-4315.